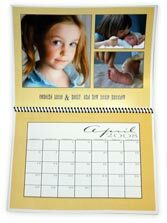 Mimosa Digital offers monthly and single page annual calendars on a wide variety of paper stocks. 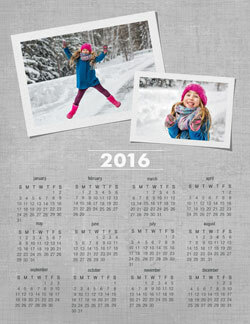 This is the perfect no-hassle way of getting custom calendars made - we do all the work for you! Just upload your photos to us. 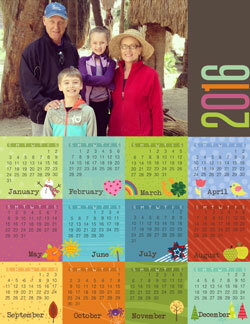 Custom calendars are great not only as holiday gifts, but also for your family to use and enjoy throughout the year! These calendar options also make for great corporate marketing gifts that are useful for showcasing your products or services to clients. Order 25 or more calendars and have your company name, logo and details on the calendar so your company is in front of your customers as they look at your calendar every day. 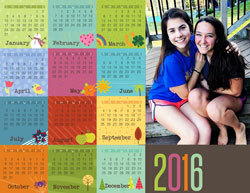 Choose from 5 unique and stylish calendar options and place your order online today! Have time and like to layout your own calendar? 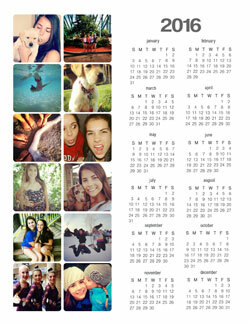 You can pick and choose from a variety of different designs and templates for that perfect monthly calendar. 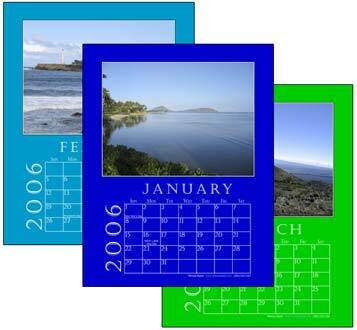 Monthly wall calendars are available in 3 sizes: 8x10, 8x12, 12x18 and spiral bound at the top. Choose from 3 background color options: white, black or rainbow (each page is a different, random color). Your photos are bound to stand out on these calendars! 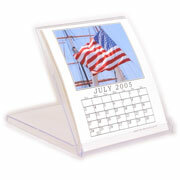 These cute 5x5 jewel case monthly calendars make for a fabulous desktop calendar gift. Choose from 3 background color options: white black or rainbow. They shp flat and make for a thoughtful corporate or personal gift. Magnet calendars are super useful for any family. These at-a-glance annual calendars are popular holiday gifts. The magnets are 8.5x11 in size and come in 5 styles: rainbow landscape, rainbox portrait, squared portrait, neutral grey portrait, and neutral grey landscape. 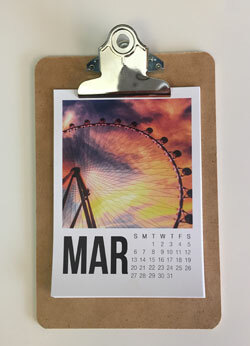 These new, super cute mini wall calendars are just 5x7 in size and come on a trendy 6x9 clipboard for your square photos. Once you place your order, you will see your cart order number (it starts with CT). Once you have that number please visit the photo upload page to upload your photos for your calendar. We will then email you a proof of your calendar for approval before we print the calendars.